"He had received a mysterious invitation to Venice just a few days after that unforgettable night. He was wondering what this was all about, then he recognized Café Tuberosa. There she was, staring at him. Suddenly it was clear. In a moment they would have the chance to start over again." Unforgettable, but in a good way? Staring at him...why not gazing or something less intense? Café Tuberosa: stalker? Ex? Watch out! All those Venice canals are perfect for drowning. Atelier Cologne Café Tuberosa1 is a new fragrance in the brand's Avant Garde collection. Tuberose seems to be overtaking rose as the fleur du jour in perfumery. Tuberose is featured in lots of new releases, mainstream and niche, but usually with a proviso: it's been made "darker," cleaner, chicer, younger, more "manly" than before. Mostly, rose has been allowed to keep its full character in recent perfumes, but tuberose, like patchouli, is often taken apart and put back together with all its most interested facets deleted or "adjusted." As I've stated ad nauseam, I like my tuberoses in my garden and in vases more than in my perfumes, but if there's tuberose in perfume I don't want banal "white flowers," food-y coconut and vanilla sugar substituting for tuberose's boisterous and florid character. How does Café Tuberosa deal with tuberose? The perfume begins with the aroma of roasted, cocoa-dusted coffee beans mixing with tangy citrus. The coffee aroma is thin and joined quickly by shrill (and waaaaay too clean) white flowers (tuberose that's been washed and bleached and washed again). The coffee-tuberose accord smells sour up close. Next (joining the coffee, cocoa and "tuberose") is a super-sweet patchouli-icing scent full of imitation vanilla extract. At this stage, Café Tuberosa smells like a too-bright (scent-wise) candle, perfect for Barbie's Boca Condo. Café Tuberosa is obnoxious (huge projection, lifelong lasting power); it reminded my partner of Giorgio Beverly Hills (style-wise). Avant garde? Only in the sense this is an experiment gone wrong. For me, Café Tuberosa is a scrubber. After scrubbing my arms with Dawn dish-washing liquid and realizing the perfume had barely budged, I took a hot shower. Café Tuberosa lingered on and I grabbed my bottle of heavenly Balsamo della Mecca and doused myself with it. Relief. Café Tuberosa takes away tuberose's soul; it smells tawdry to me. As long as it does not mean my death, I hope to never smell Café Tuberosa again. 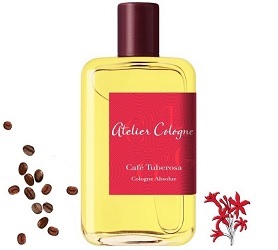 Atelier Cologne Café Tuberosa Cologne Absolue was developed by perfumer Jérôme Epinette. It is available in three sizes: 30 ml/$85, 100 ml/$150 and 200 ml/$255. 1. Listed notes of bergamot, tangerine, cardamom, tuberose, rose, "coffee espresso accord," patchouli, vanilla, cacao. 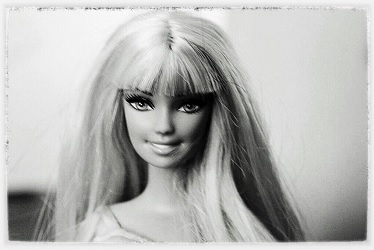 Note: top image is Barbie by vanessa v. at flickr; some rights reserved. Why or how does something like this even get into production?? What were they thinking? Lack of judicial curating has spoiled this brand for me despite a few nice “oud”-related colognes. Markus, but this is just my take on it, others may love it. I’m always sad to see your review of a fragrance you didn’t like. It means that you had to wear it for some time, and I’m always very stressed when I wear something I don’t like. I’m very uneducated in fragrances that are more suited for men, so I’d like to ask you a question here, if you don’t mind. Have you tried anything from Les Liquides Imaginaires? My male colleague wears Fortis from the line. (Everyone seems to compare it to Black Afgano.) Since I like the smell I decided to investigate the brand online. They have a “PEAU DE BÊTE” perfume listed on their web-site. I wonder if that lives up to it’s name. Veronika…hey, I’m used to wearing bad perfumes…that’s the majority of what I test! And I’ve never tried Peau de Bete…but I think ir has lots of fans. As soon as you mentioned Giorgio, I thought oh yeah, it does resemble it in feeling. I like it well enough though, after the initial blast. Thanks for the great review! I love Cafe Tuberose and get compliments every time I wear it. Pity it was so awful on you, but all the more for me! Cazaubon…indeed, no need to stockpile! Ha! Ha! Well, glad I’m not alone in my experience with this one. It did feel like it was stalking me. I did enjoy the smell of coffee for about 10 minutes but it was all downhill from there and I had a hard time removing it, too. I have yet to find a single Atelier I’d want to own (not that I’m super determined or anything). Elisa…the tenacity was astounding!!! My poor shirt will never be the same…. I had the same experience, did a thorough scrub and shower, and even then still had shudders. JJ: it’s right up there with the Clementine California thing as my least favorite from the line. Total scrubber! Glad everyone is expressing similar disdain! Atelier is just not my perfume house, it seems. rxchel: I don’t rush to sample the line anymore…but with Sephora carrying it I always seem to smell the new ones. I couldn’t wait to see how the Barbie photo tied into this review, and was not disappointed! Too bad the fragrance WAS a disappointment. By the name it sounded so unique and creative. I haven’t sought it out, though, as I don’t seem to have the right “chemistry” for this house. I’m with cazaubon. I loved it! Although I do admit the initial bast of coffee is a bit too screechy, it lasts only a few minutes and the dry down is beautiful on me. I seem to be drawn to candle like scents as long as they aren’t too sweet, so Kevin I would say your review is technically accurate but olfactorily (don’t think this is an actual word!) we definitely had completely different reactions. ???? Colocha: oh, yes…many people love it! Glad you chimed in. I LOVED this review, Kevin. I also happened to really like the fragrance, which on my skin sounds nothing like your experience with it (THANK GOODNESS). I often bemoan my reptilian-cold, scent-eating skin, but it may have made all the difference in this one! Spot on review IMHO. A very weird, but not in a good way, scent. Only Atelier I still enjoy and glad to have a decant of is Sous le toit de Paris. Will someone ever make a scent that has coffee beans in all their richness yet interesting and wearable? Floragal, did you ever try A-Men Pure Coffee…I wonder if that’s extinct now? I love how much you hate this perfume Kevin! I’m not a fan of the line, but mostly I just like your visceral responses, whichever way they go. I tried Figment Man, by the way, and I both liked it she smelled the dead mouse! A small sample should do me fine. Thank God I’m not alone in this one. After watching a YouTube blogger who I otherwise respect, I made a beeline to the Atelier Cologne display in Sephora. Now, I could have been influenced by the loud music and tacky makeup displays, but one smell of Cafe Tuberose made me recoil. It was awful. So I’m glad I wasn’t alone, though even if I was, I’d stand by my assessment.